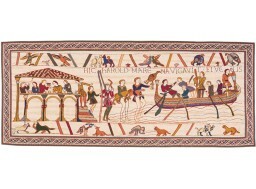 The Bayeux Tapestry, also known as Queen Mathilde's Tapestry, is originally an eleventh century embroidery, inscribed on the UNESCO Memory of the World Register since 2007. 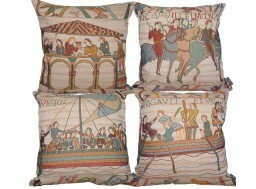 This medieval wall hanging shows facts since the end of the reign of the King of England in 1064 whose stake was the throne of England where key events of the battle are detailed, The tapestry of Bayeux gives indications on the clothes, the castles, the ships and the conditions of life of this time and constitutes then one of the rare examples of the profane Roman art. 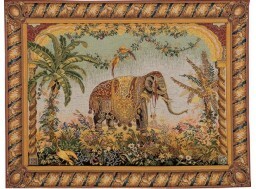 Preserved until the late eighteenth century in the Treasury Bayeux Cathedral, it escaped destruction during the French Revolution. It is exhibited today at the William the Conqueror Center where a space is entirely dedicated to him. 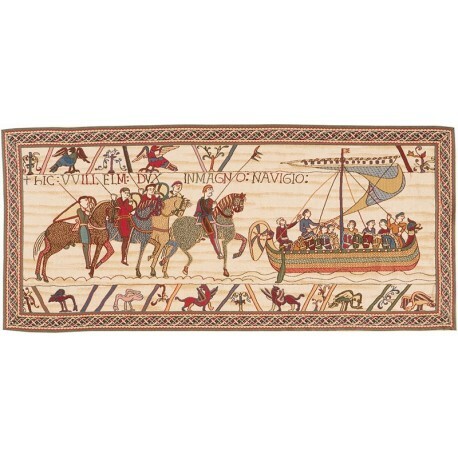 The tapestry "departure of the fleet" represents a part of the Bayeux tapestry, the latter representing several scenes including that of "boarding". 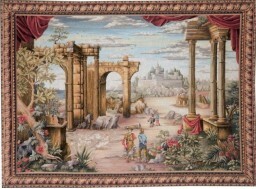 The reproduction of this tapestry is woven in a French factory at "Point Jacquard" - Weaving 80% cotton. 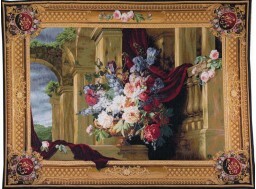 A Certificate of Authenticity is affixed to the back of the tapestry.